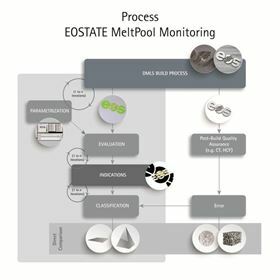 EOS’ EOSTATE MeltPool processing monitoring system. AM specialist EOS plans to introduce its EOSTATE MeltPool processing monitoring system to pilot customers, the company says. The system, which is an add-on to the EOS M 290 DMLS system reportedly improves part traceability and allows for an automated surveillance and analysis of the melt pool during the DMLS build process.